This gadget came to my attention and I had to buy one. 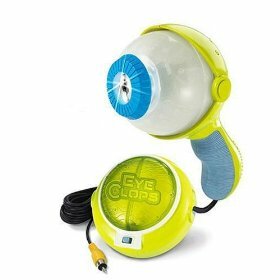 It’s the Jakks EyeClops Bionic Eye. For $40 (from Amazon) you get an SD resolution macro video camera. If you’re fascinated by things that can only be seem with a high level of magnification this is great. The quality isn’t fantastic, but it’s good, especially considering it’s $40. It outputs via a standard (RCA) SD cable, so you should be able to capture the results.